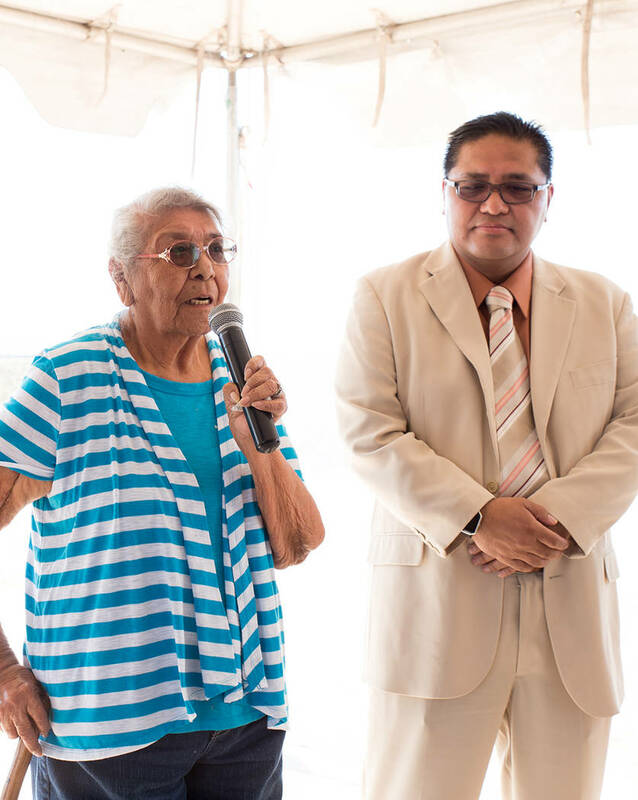 This month, the Moapa Band of Paiutes turned on the switch to a new era of renewable energy emerging from their tribal lands, while sharing their vision of Nevada’s solar-powered future. This month, the Moapa Band of Paiutes turned on the switch to a new era of renewable energy emerging from their tribal lands while sharing their vision of Nevada’s solar-powered future. Just 50 miles northeast of Las Vegas on Interstate 15, a sea of 3.2 million photovoltaic solar panels glistens in the sunlight of a warm March day. The panels have been interspersed throughout 2,000 acres of the Moapa Band’s 72,000 acres of property. Combined, they create 250 megawatts of electricity when the sun is shining on the Southern Nevada desert. 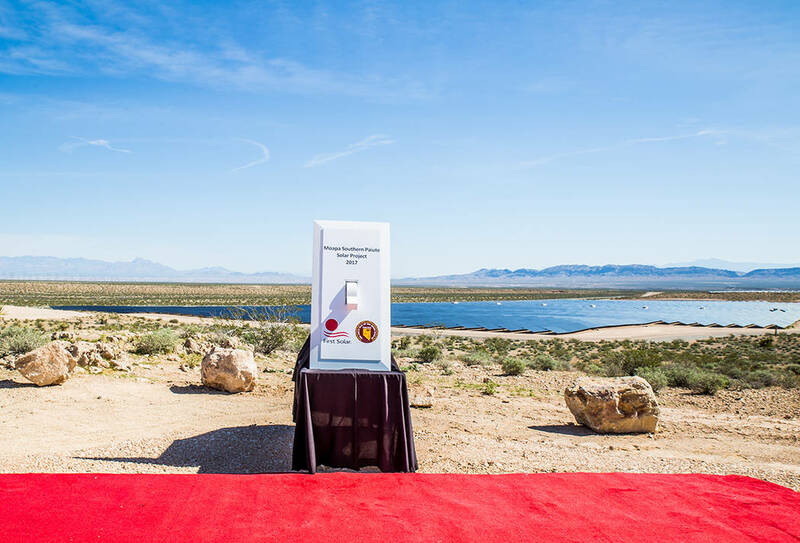 Interstate power transmission lines connect solar-generated electricity from Moapa tribal lands to the Los Angeles Department of Water and Power. Reiko Kerr, senior assistant general manager of power systems for the LADWP, noted that the solar facility will provide enough renewable energy for 93,000 homes within its region of operations. 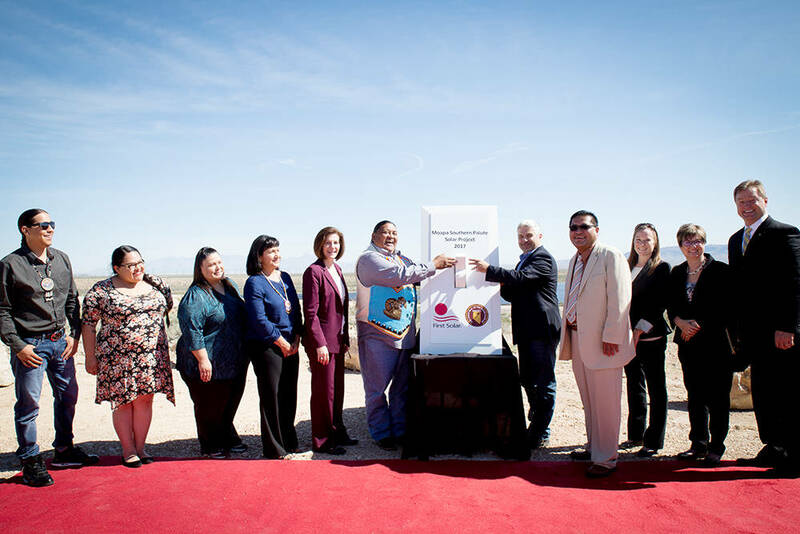 The power purchase agreement with First Solar and the Moapa Band of Paiutes will contribute 3 percent renewable energy resources toward the utility’s target goal of 25 percent of its power generation portfolio by 2025. ■ The Moapa Band of Paiutes became the first Native Americans to commission a utility-scale solar farm on tribal lands. ■ There were 115 members of families living on the Moapa reservation working with First Solar Inc. to design and construct the project over the last seven years, along with 485 additional local contractors. ■ Two female members of the Moapa Band of Paiutes are now fully certified electricians and members of the International Brotherhood of Electrical Workers. Both will continue as employees of First Solar to provide ongoing operation and maintenance for the site. ■ The solar panels have been located strategically with respect to the landscape and sacred tribal grounds, allowing for large sections of native plant growth in between installation areas. The last six miles of dirt roadway to the site have been left unfinished, to preserve the local habitat of the desert tortoise population. “Desert Tortoise Crossing” signs alert drivers along the roadway, followed by traffic signs that limit vehicle speeds to 25 miles per hour. Chairman Daboda also praised the local Toiyabe chapter of the Sierra Club for its support in persuading NV Energy to close down the Reid-Gardner coal-fired power plant, just 15 miles away from the tribal land. The smokestack emissions from the 557-megawatt facility had affected the health of native residents during 52 years of continuous operations. The plant was closed completely during early March, just a week prior to the Moapa commissioning event. By contrast, the new First Solar power plant will displace 341,000 tons of equivalent CO2 that would have been emitted by a 250-megawatt, coal-burning power plant. The new utility-scale installation is the largest thin-film photovoltaic solar farm in Nevada, covering the equivalent of 450 football fields, according to Georges Antoun, chief commercial officer at First Solar. The company has contracted to construct more than 1,200 megawatts of solar power generation projects throughout the state. Thin-film solar panels cost less to produce than silicon-based crystalline panels but are not quite as efficient. Thin-film solar cells are manufactured more quickly from less-expensive glass substrates coated with a film of cadmium-telluride. Solar cell efficiency from thin-film technology converts about 14 to 16 percent of the energy received from the sun into electricity, but newer technologies and processes are being developed by First Solar to increase yield to 22 percent. The company, based in Tempe, Arizona, manufactures three gigawatts of thin-film solar panels each year and has large installations throughout the country. The Topaz Solar Farm, near the central coast of California, provides 550 megawatts of power when the sun is shining. U.S. Sens. Dean Heller, R-Nev., and Catherine Cortez-Masto, D-Nev., shared a joint press conference for the first time since Cortez-Masto was elected to the U.S. Senate in November 2016. Sen. Heller emphasized his recent work to extend a federal investment tax credit for solar installations to help the industry continue to grow through the assistance of long-term, predictable government policies. He credited his son, family members and the millennial generation for persuading him about the benefits of renewable energy for Nevada.